He kindly shared his plans (descriptions in French) which you can download here. 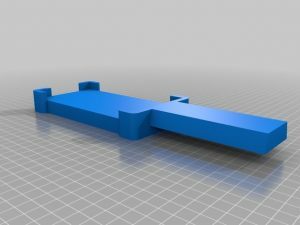 Update: iPhone X users can now download a 3D-printable design from Thingiverse. The proof-of-concept cardboard dovetail gave an alignment within 2 degrees, while a proper rigid dovetail made of wood can get you within a degree. Not bad! Method 1: Using PS Align Pro’s Daytime alignment tool. STEP 1: Set your mount to zero position (declination +90°) which will give you a saddle/OTA exactly parallel to the RA axis. STEP 2: Set Polar Scope Align Pro to “Auto” location and start the daytime alignment tool (Sun icon). STEP 3: Follow the on-screen instructions. Arrows will be showing you the up/down and left/right adjustment you have to do using the altitude and azimuth controls of your equatorial mount (NOT RA/declination). When you are close, the celestial pole will appear as a target to help you guide it to the center of the screen. For reference, the outer of the targetting circles has a radius of 4 degrees. Method 2: Using a physical compass (and polar scope). STEP 1: Set up your mount pointing roughly to the North. 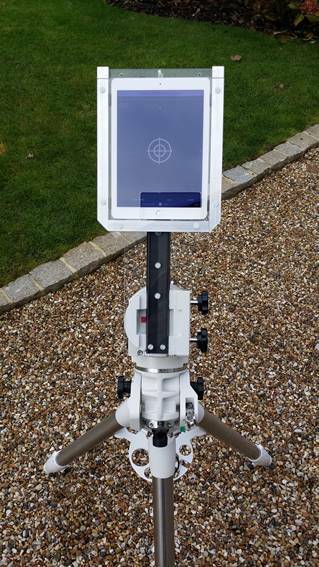 STEP 2: Set Polar Scope Align Pro to “Auto” location and open the Bubble Level / Compass tool. Get the magnetic declination reading shown on the right of the display (drown vertically, with data provided by stephentrainor’s ObjectiveWMM). STEP 3: Applying the magnetic declination for your location as an offset, find the true north with the compass and with the hairline sight see where a North (or South for the S. hemishpere) bearing line that crosses your RA axis and hits the horizon / a distant object. STEP 4: Lower your altitude so that the polar scope points near the horizon and using the alt/azimuth adjustment knobs find the point in the horizon that you noted as marking the true north. 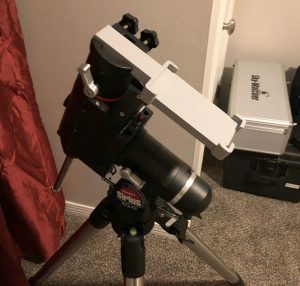 STEP 5: Use either the Polar Scope Align’s Bubble Level or Daytime alignment tools (“alt:” reading) to adjust the inclination of your mount to match your latitude, using tha altitude adjustment bolts (similar to method 1). Method 3: Using a planetarium app. 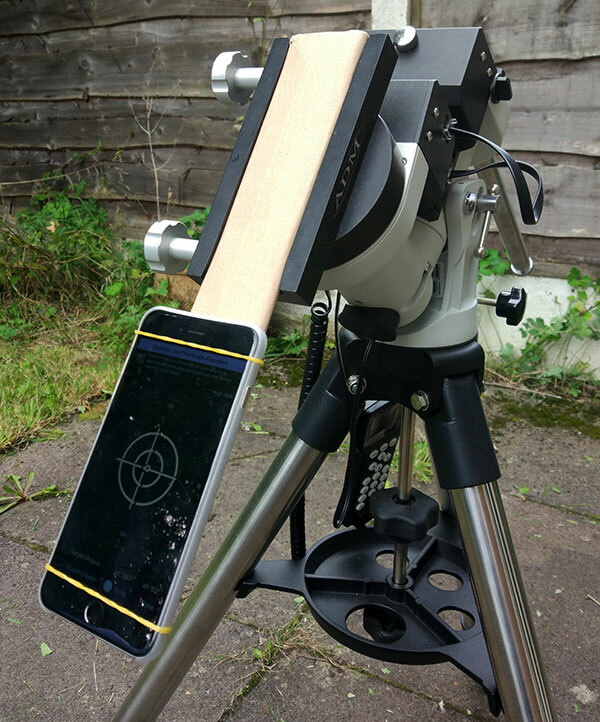 This is a quick method popularized mainly by Sky & Telescope, in which you set your phone perpendicular to the polar scope, which means on the flat surface of the wedge, or, similar to the image at the top of the article for an equatorial mount. The problem with this method is that IT DOESN’T ACTUALLY WORK as described. In the above setup, which is quite similar to what the original article that popularized the method showed, my magnetometer is off by about 10 degrees. If I set it flat on a metal wedge, I bet it would be off even more! So, if you want to use it, you’d better figure out a way to avoid magnetic interference. STEP 1: Load a planetarium app to your phone (Polar Scope Align doesn’t have a utility for this, since planetarium apps do it well and Method 1 works much better for me). Sky Safari Pro and SkEye even include crosshairs, which will come in handy. 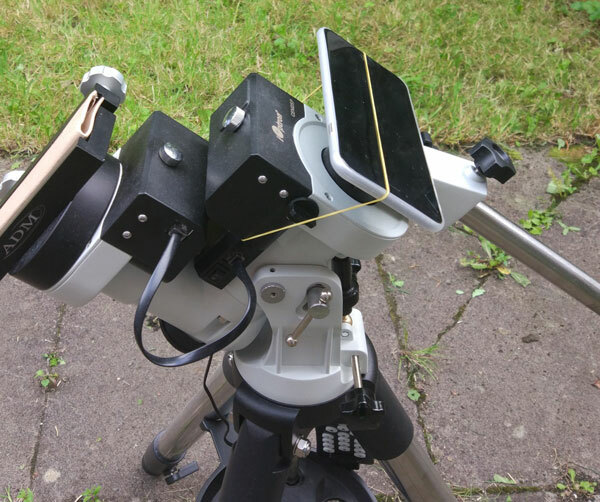 STEP 2: Strap your phone to the flat surface of your wedge, or perpendicular to your polar scope if you don’t have a wedge. If you have your scope pointing at 90 degrees declination, you could even strap it to the lens cap. Again it is best if you can have a diy non-metallic extension to mount the phone on to avoid magnetic interference. 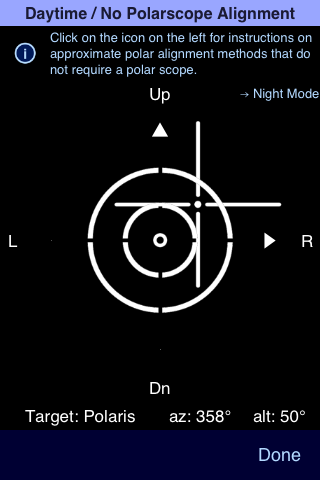 STEP 3: If you are on the North hemisphere use the alt/az adjustment knobs to center your planetarium view to the South celestial pole (and vice versa). Method 4: Using “null” star alignment on a goto mount. 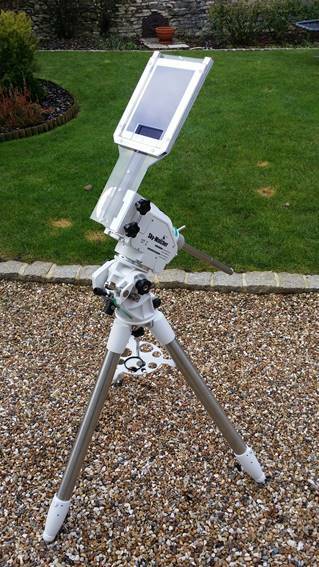 STEP 1: Set up your mount pointing roughly to the North and start a star alignment as you would do during the night. STEP 2: Don’t do any adjustments, blindly accept the default positions of the alignment stars. STEP 3: Use goto to point to the sun (some mounts may refuse for safety reasons – perhaps using coordinates will work for those). If this is not daytime polar alignment (night – you just didn’t have a line of sight to the polar star), goto a bright star instead. STEP 4: Use ONLY the alt/az adjustment knobs to bring the intended target to your eyepiece.